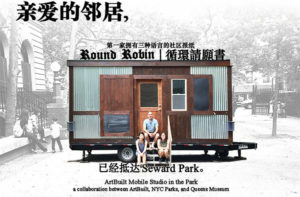 ArtBuilt Mobile Studio in the Park | ArtBuilt 公園裡的藝術工作室 – 華僑社會福利社 Immigrant Social Services, Inc.
ArtBuilt Mobile Studio, Queens Museum and NYC Parks invite local residents and immigrants to the launch of the trilingual newspaper project, Round Robin, in Seward Park with resident artists Art Parley, an art collective formed by Sue Jeong Ka and Melissa Liu! 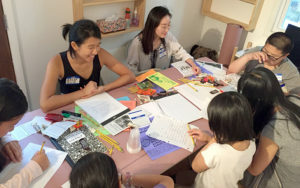 Come by during Art Parley’s Open Studio hours to learn about the next six weeks of activities and workshops around Round Robin, an ongoing socially-engaged project to build spaces for cross-cultural solidarity and understanding through storytelling, conversation, and empathy resonant to participants from diasporic communities in Chinatown, LES, and Two Bridges. Please be sure to like and follow ArtBuilt Mobile Studios’ Facebook page for updated schedule and event information. Learn more. 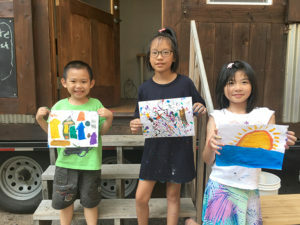 Writer and Journalist Kelly Chan will lead a drop-in workshop that will encourage participants to develop their individual writing and storytelling practices. Join her on Wednesday evenings for weekly, prompt-driven free –writing sessions and activities that will investigate local and personal histories and explore different means of expressing them. Snacks and Metrocards provided by Art Paley and Hamilton-Madison House. Click here full program schedule.